If you own or manage a Food Truck operation in Massachusetts, there is no doubt that you work very hard every day to provide your customers with fresh and tastey food offerings along with your own special brand of service that brings fans back for more. 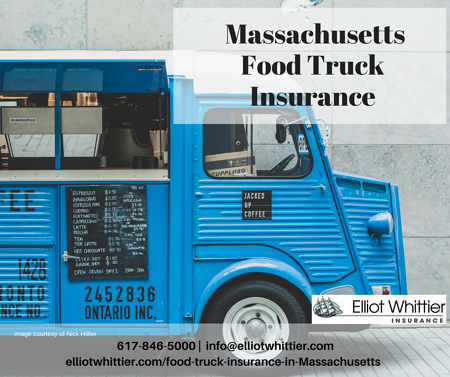 But what about your Massachusetts food truck insurance? Is it working just as hard? Whether you are just starting your food truck business, or you are expanding and it's time to take a hard look at your risks and costs, you'll want to make sure you have the right business insurance options. You will want to make sure that the many risks that you are exposed to every day won't interrupt or destroy what you have worked so hard to build. The best way to make sure is to have an Insurance Program that is specific for Food Trucks. The only problem is not every insurance agent has access Special Programs for Insurance for Food Trucks in Massachusetts. We do. 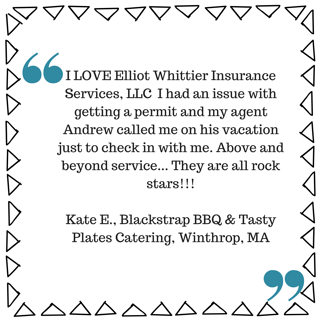 Why Elliot Whittier Insurance for your Food Truck Business? We are local, just like you. Our offices are in Winthrop MA & Danvers MA but we can take care of nearly all of your needs electronically. We have been doing Massachusetts Business Insurance for decades. We can expertly help you build a program that is right for you. We understand Certificates of Insurance inside and out and we're happy to help provide them quickly for your venues, commissary and other interested partners as needed. Claims happen. We have a dedicated Claims Specialist on staff. Deal with one insurance agency for all your insurance needs. Yes, we can insure your home, your car, your vacation home, your income properties, you name it. Looking for options for food truck insurance for your business? Give Chris Millerick O'Keefe a call today at 617-846-5000 or fill out the form below 24/7. We’d be happy to assess your needs, review current policies, and design a comprehensive insurance program that keeps your business well protected, lowers your risks, and lets you sleep peacefully.